I love the Toparchery Handmade Recurve Bow 53'' Traditional Archery Hunting Longbow as because its classic look appears like Mongolian horse bow. Mongolian horse bow is known for its short design and fast shooting. When I touch it, it carried me to a time where longbows were a part of daily life, and they mainly used it for hunting and combat instead of recreation only. Toparchery is a well-reputed company connected with manufacturing ample of Archery bows, 53-inches traditional hunting bow is one of their top selling product in the market right now. They also offer excellent quality bow in reasonable price which makes it appealing among pro hunters or beginners and bow hobbyists. Toparchery handmade recurve bow comes up with 53 inches bow length and 30 to 50 pounds weight with a 5-pound difference which makes it is the best longbow for beginners . 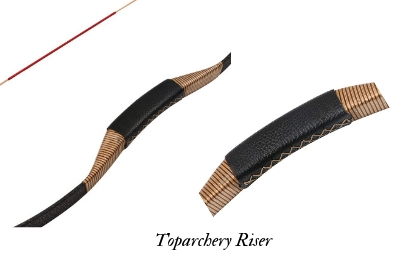 The stable features of Toparchery make it a great choice who is looking for the best longbow for deer hunting. The wooden riser and fiberglass made limbs makes it durable and sturdy enough for hunting large games as well as fiberglass will save your bow from bad or wet weather too. It is a beautiful traditional looking longbow which allows you to use by both right and left hand. You will face no stress to handle it in the woods during hunting as it is lightweight 1.92 pounds only. You will get chance to adjust your draw length as it ranges from 28’’ to 31’’ with a brace height of 16-18cm. It’s a mighty and good bow for any beginner bowmen. Toparchery 53-inch advance with a black paracord pre-string along with a red and tan bowstring to string with it for ready to shot. 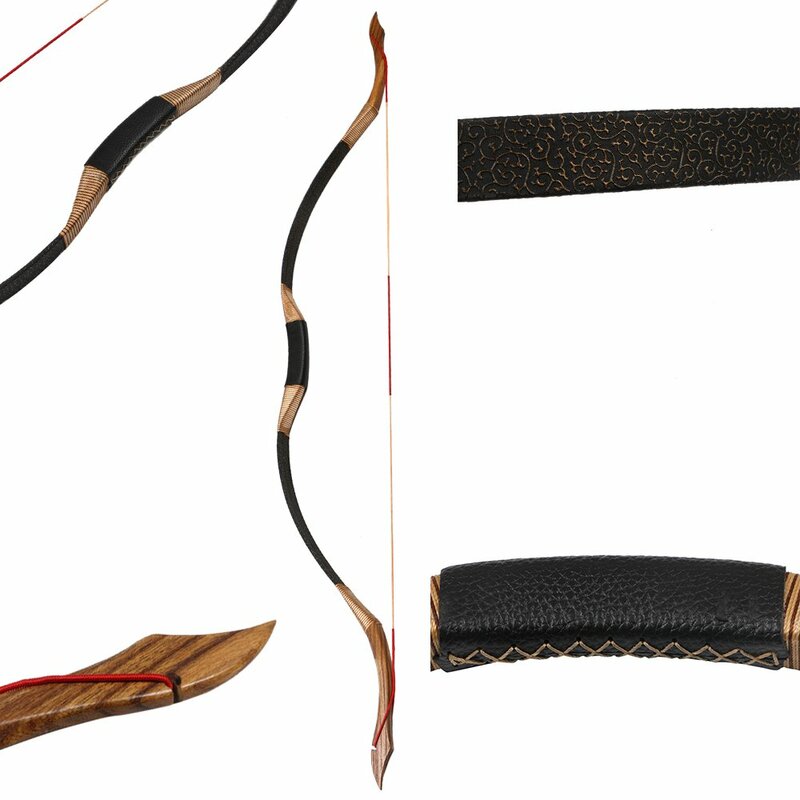 The center of this handmade recurve bow crafted with faux leather which looks decent. Most importantly it is the best takedown longbow which is quiet and accurate for hunting game. Like other takedown bows Toparchery is not come up separately, so you no need to spend your time to assemble it right after received. It is also beneficial to those who are new in archery and not familiar with the process of accumulating the parts of longbow together. The manufacturer also includes standard informational documents in the package which may help you to reach them straightforwardly in case of any problem arises. Q: Is this a quiet enough and accurate bow for hunting game? Ans: Yes. It’s a great little bow regarding accuracy and low noise as well as perfect choice for hunting game like White Tail or Sambar Deer, rabbit or wild turkey. Q: Does it come up with string? Ans: Yes! 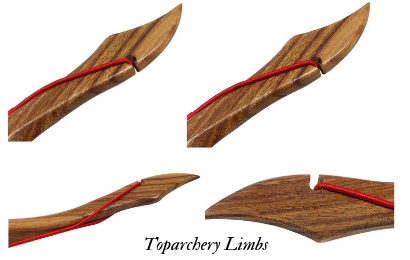 Toparchery supplies a red and tan color bow string along with its package. Q: Is there any option to choose draw weight according to my capacity? Ans: Yes! It comes up with a wide range of draw weight starting from 30 pounds up to 50 pounds. You can choose the draw weight according to your need and capability. Q: Does it suitable for leftist and rightist bowmen? Ans: Yes! It is a good design ambidextrous bow, no need to worry about your right or left dominant hand. We have found some downside of this bow like the riser tends to separate from the limbs after extended use. As an economical bow, it is recommended not to use more than 50 shot per day, as it is most suitable for occasional shooter. The tips are pasted to the fiberglass limbs and swathed with a nylon rope or string which it seems not very firm and safe. Also, some user complains that the handle is not covering proper way as it wears after many uses. Unstring the pre-assembled paracord string may seem hard for the beginners. If you have face the same and not know how to string your bow appropriately, you can find quite some tutorials available online to help you further. I-sport Traditional Recurve Bow is an excellent alternative for those who are looking for a bow that has similar features but a bit more advanced towards the beginner and lighter-frame archers. Like the Traditional Toparchery Recurve Bow, it has a significant number of customer reviews and the same price point, but it has two distinct bow length. Length for the 30lb bow is 124cm/ 48.8inch, and for 35-50lb the bow length is 144cm/ 56.6inch with a safe draw length of 29inch at brace height 7inch. Nonetheless, the I-sport Traditional Recurve Bow crafted with Sophora Japonica wood bow tips, high strength epoxy resin thin sheet bow limbs, black leather decorated riser. Sturdy materials, subtle craft, pure handmade artistry makes it is a high quality traditional recurve bow for hunting and shooting. The Toparchery Handmade Recurve Bow 53'' Traditional Archery Hunting Longbow is what you need if you are a newbie deerstalker. Though there is some downfall of this beginner longbow, as a hunting weapon, it is undoubtedly able to make a clean hit of larger games. It’s quiet without the accessories, lightweight and sturdy in design. Top of that, Toparchery has a good reputation in the field of archery for a long time because of its customer service. Hence, you can rely on it for your occasional hunting and target practice.